I am staying with my WTI oil price expectations for the next several weeks to range between $43–$53 per barrel. With the continuing fallout from the tropical storm Harvey, I expect increased volatility in oil prices. I have updated my graph. 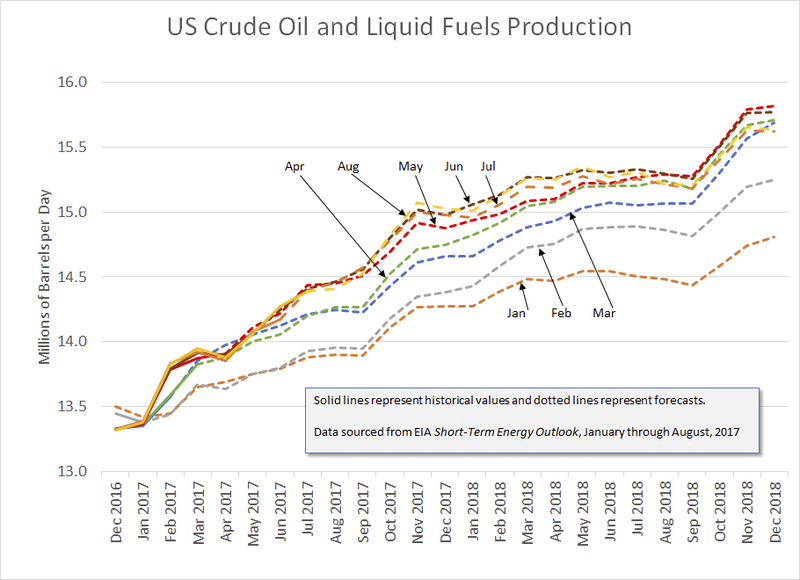 As a refresher, one of the benchmarks that I track is the US Energy Information Administration’s Short Term Energy Outlook data for US crude oil and liquid fuels production as shown in the next graph, which is an updated version from the prior month. Every month the EIA releases a new forecast. The January forecast is the lowest line along the horizontal axis, and the August forecast is near the top for much, but not all, of the graph. Solid-line portions represent historical data, and the dotted-line portions are forecasts. Because of data revisions, not all months start from the same point. Please note that liquid fuels include ethanol, natural gas plant liquids, and biodiesel. Looking at the updated graph, we note that the last four months—May, June, July, and August—seem to be clustered together. In other words, the forecasts seem to be converging. Dan Dicker in his article “It’s Finally Time to Look at Oil Stocks” (subscription might be required) states that oil prices are likely to rise by year-end. The trend for oil is finally about to change. Oil has been range-bound for all of 2017, with rigs continuing to increase and stockpiles continuing to swell. But rigs are beginning to roll over and are, I believe, going to decrease through the rest of the year. And more importantly, stockpiles are beginning to sink, finally going under the 10-year average for the first time in 4 years. That trend is going to continue as well. Oil is about to break out of its range — to the upside. Of course, the oil companies deciding to cut production and capex will accelerate both of these trends, making oil even more likely to rise to $60 by year end — maybe even $70. I believe oil prices will get constructive soon, overcoming their year-long range between $43 and $54 dollars a barrel. We can see three factors that are going to push oil out of this range to the upside. First, we see oil stockpiles falling under the 5-year average, signifying the rebalancing is coming. Second, we see rig counts beginning to roll over, making the projections for increased production in 2018 far too optimistic. And third, major rollbacks of capex from oil producers, announced in their second-quarter reports, are going to accelerate both of these trends. I disagree with Dicker. We have just examined the graph for expected production. As discussed, recent forecasts have converged. There is a time lag between drilling and production. So, I expect that much of the remaining production for 2017 is already set in the forecast. According to a Wall Street Journal article “Investors Eager to Hear Shale Companies’ Plans for Rest of 2017,” (subscription required) many oil companies have already hedging contracts in place, and there are many drilled-but-uncompleted wells waiting to be connected to pipelines. Furthermore, a Financial Times article “Oil Traders grapple with US crude conundrum” (subscription required) suggests that prices are likely to stay low. Behind this, analysts and traders say, is seemingly unstoppable US oil production. Those betting the industry will continue ramping up output are — for now — firmly winning the biggest debate in the oil sector regarding just how much production, led by the shale revolution, can grow despite prices languishing below $50 a barrel. “The train has left the station in terms of shale,” said Gary Ross, head of Pira Energy, a unit of S&P Global Platts. The so-called Brent-WTI spread, which measures the price difference between the two big crude markers, is just one indicator that points to traders betting that US shale output will grow in excess of 1m barrels a day next year, or enough to meet about 75 per cent of anticipated global demand growth. And just today, the Wall Street Journal published an article “Saudi Arabia, Russia Pushing for Three-Month Extension to Oil Cut Deal” (subscription required). If these two countries expected prices to recover above $60 by year-end, they likely would not have called for an extension. The end of 2017 is only a few short months away. We will soon learn if $60 per barrel has been achieved. My expectation is that, with already anticipated increased production, oil prices will remain below $60 per barrel. Well, I awake with horror and sadness this morning to discover the 4th largest city in America and the “Heart” of oil production in and around the Gulf is devastated by Hurricane Harvey, a storm displacing about 500,000 people and shutting down oil rigs, curtailing refinery production! After checking my portfolio twice, I still don’t understand why my energy stocks are tumbling rather than rising? As I have few none of the subscriptions which you sight while writing your thorough analysis. I am happy to be able to read your summaries and find some answers as you connect the dots and narrow down the complexities. But it remains an enigma to me: Why do the disruptions which will surely continue, as we are at the very start of a volatile storm season, do little to increase energy prices. Gasoline prices rise, but energy and pipelines do not respond on the up side! Already production rigs have been rolling over, refineries closing, and if I understand correctly, supply already is only expected to meet 75% of anticipated global demand even without today’s horrific declines. IMO, the increased global demands, lower supplies and probably continued storm disruptions, along with a strong agreement by “Saudi Arabia and Russia to Push for a Three-Month Extension to cut Oil” should allow for prices above the $60.00 mark! I’m not sure what I am missing in your analysis? Thx for interpreting the data and sorry if I’ve missed the point. Energy stocks are down because a substantial portion of the US refinery capacity has been knocked offline. There has been more refinery capacity knocked offline than production capacity. As a consequence, either companies will stop producing oil from some wells or oil inventories will increase. In other words, the oil imbalance is worse now. Because of the reduced refinery capacity, gasoline prices have risen. Under normal conditions, refineries are operating at high capacities. When a few refineries are knocked offline, that creates a shortage of refined products. So for refineries that are not located near Houston, they are enjoying good profits with lower feedstock prices and higher products prices. Now, as far as pipelines are concerned, with reduced refinery capacity, there is less oil being transported. Less oil being transported means less earnings. There is still a worldwide glut of oil production in the world. 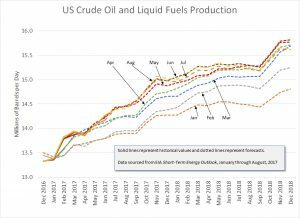 In the US, that glut has become worse because refineries were hit harder than production production facilities, as stated earlier. Here’s a Financial Times article that might shed some light for you: “Tropical storm Harvey and energy markets: 5 things to watch” (subscription required).